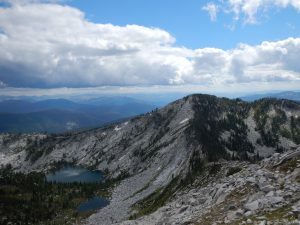 The U.S Congress designated the Selway – Bitterroot Wilderness in 1964 as one of the original wildernesses under the 1964 Wilderness Act. Acreage was added in 1980 in the Central Idaho Wilderness Act (which also designated what is now known as the Frank Church – River of No Return Wilderness) and it now has a total of 1,340,502 acres. Idaho contains approximately 1,089,059 acres. Montana contains approximately 251,443 acres. Contiguous wild areas exceeding one million acres are extremely rare in the lower 48 states. Only the 600-foot wide Southern Nez Perce Trail (The Magruder Corridor), an unimproved dirt road and its buffer, separates the Selway – Bitterroot from the even more massive Frank Church – River of No Return Wilderness. The Selway – Bitterroot Wilderness is managed by the U.S Forest Service. The Selway – Bitterroot Wilderness straddles both sides of the Bitterroot Range, which forms the Idaho and Montana border. It includes most of the Wild & Scenic Selway River, except for the upper headwaters, which are found within the Frank Church – River of No Return Wilderness. Steelhead and salmon still make their way up the Selway River as they have done for millennia. This vast and wild area is one of the roughest mountain regions on earth, a country of high ridges dropping off into steep-walled canyons. Giant western red cedars and other plants more typical of the coast are found in the wetter parts of the Selway River and its tributaries, a testament to the area’s uniqueness. The Selway River canyon provides winter range for ungulates like elk and two species of deer. Moose, wolves, black bears, fishers, wolverines, harlequin ducks, mountain goats, and possibly grizzly (tracks have been recorded recently in the wilderness and a grizzly was accidentally killed in Clearwater wildlands to the north of the wilderness) are all indicators of the large size and wildness of this region. Elevations range from 1,700 feet to over 10,000 feet, making the Selway – Bitterroot a very diverse area in terms of life zones. Many trails pierce the wilderness though there are some remote spots without maintained trails. The Forest Service allows only one party per day to launch non-motorized boats on the Selway River during the main floating season, which adds to its reputation as the wildest river in the lower 48. This management rule is designed, in part, to give rare and sensitive species like the harlequin duck space to nest and raise their young. In most instances, fires are allowed to play their natural role, especially in the Idaho portion of the wilderness. Indeed, the Selway-Bitterroot was the first place that managers intentionally allowed a lightning strike to burn into a fire and go out on its own in the early 70s. All is not well within the Selway – Bitterroot Wilderness, however. Overbuilt trails, structures, and the penchant of some US Forest Service managers to engage in misguided (though usually well-intended) manipulation makes the area less wild than it should be. Developed Forest Service sites, including landing-meadows, detract from the area’s wildness. The game-farming mentality of the Idaho Fish and Game Department, which puts political pressure on the Forest Service to abdicate its responsibilities to protect the wilderness character, is also a tremendous threat to the wilderness.